Following intramuscular or subcutaneous injection of Iron 100 Inj., the haemoglobin-concentration in the blood and packed cell volume increase rapidly, especially in iron deficiency anaemia in animals. Most piglets are born with minimum iron reserves, and after a few days the red blood cell production begins to decrease and a deficiency in the overwhelming growth of the young animals is noticed. 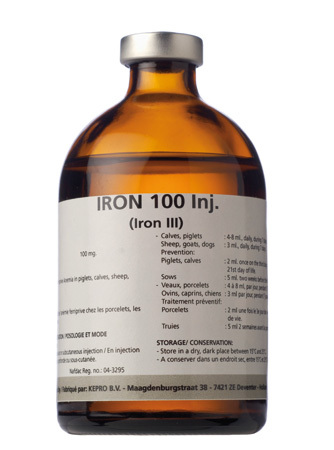 Following intramuscular or subcutaneous injection of Iron 100 Inj., the haemoglobin-concentration in the blood and packed cell volume increase rapidly, especially in iron deficiency anaemia in animals. Most piglets are born with minimum iron reserves, and after a few days the red blood cell production begins to decrease and a deficiency in the overwhelming growth of the young animals is noticed. Therefore it is very important to supply this depletion of iron for normal growth and development of the young animals. It has been proven that a dose of 2 ml given within the first 3 days of birth shows no loss of weight or health. 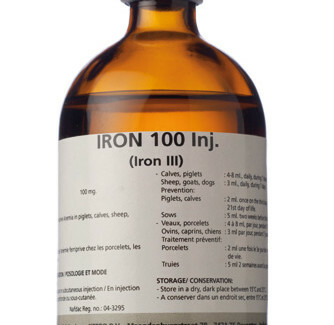 Iron supplement should be given as injection as a prophylactic aid to prevent iron deficiency anaemia and the consequences (loss of appetite, diarrhoea, retarded growth, and diminished resistance against infectious agents and in changing the of atmospheric conditions). Iron 100 Inj. is indicated for prevention and treatment of iron deficiency anaemia in piglets, calves, foals, pigs, cattle, horses, sheep, goats and dogs. It is especially necessary in newborns and animals in anaemic conditions. Secondary anaemia due to parasitic and bacterial infections, stress conditions (also due to transport), for the betterment of breeding and growth of young animals, as supporting treatment of infectious diseases and in blood loss. Pigs : 3 – 5 ml 1st injection, when necessary 2nd injection 7 days later. Piglets : 1 – 2 ml on 3rd day of life and on 5th day of life. Cattle, horses : 5 – 8 ml 1st injection, when necessary 2nd injection 7 days later. Calves, foals : 3 – 8 ml in the 1st week of life, when necessary 2nd injection 7 days later. Sheep, goats : 3 – 4 ml 1st injection, when necessary 2nd injection 7 days later. Dogs : 0.5 – 2 ml 1st injection, when necessary 2nd injection 7 days later. Piglets : 2 ml on 3rd day of life and on 21st day of life. Sows : 5 ml two weeks before farrowing.